Even our medical team can't remember a time when someone's done something as significant as this. It's more like a car accident injury. Gold Coast tall Sam Day will likely miss most of the 2017 season after dislocating his right hip against the Brisbane Lions on Sunday, SUNS GM- Football Operations Marcus Ashcroft says. Day was injured late in the first quarter of the SUNS' 24-point JLT Community Series win over the Lions, when his right foot stuck in the turf as he contested a ball with Lions defender Jack Frost. Ashcroft told SEN radio on Monday morning Day had suffered some bone damage in the incident, with his injury more common among car crash victims than footballers. "It's a once-in-a-lifetime injury I think in footy circles anyway. We haven't heard of it before, but Sam does have a fractured hip dislocation," Ashcroft said. "His hip did dislocate, it took a bit of bone with it, so it is fairly significant. He gets surgery later today (Monday) and more than likely will miss the majority of the year. "Even our medical team can't remember a time when someone's done something as significant as this. It's more like a car accident injury. "Unfortunately for Sam who's had such a great pre-season, he's going to miss most of the year." Ashcroft said the SUNS would have a better idea of Day's likely return date after Monday's operation. "The surgery today is going to be more of an exploratory nature where they check to see the exact extent of the damage. We know at this stage some bone has been damaged and taken away, so once the surgeons get in there we'll know exactly where it sits," Ashcroft said. Meanwhile, Ashcroft said former SUNS skipper Gary Ablett was on track to return in Gold Coast's third and final JLT game, against the Western Bulldogs at Metricon Stadium on March 9. Ablett has battled injury since dislocating his left shoulder against Collingwood in round 16, 2014. 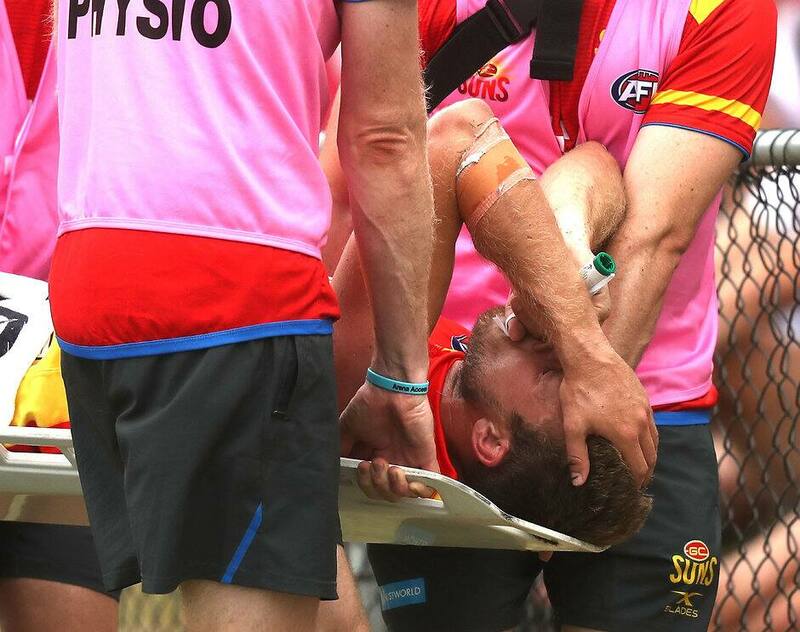 After managing just six games in 2015 – a left medial ligament tear sidelined him for the final six rounds – Ablett played 14 of the SUNS' first 15 games last season before again dislocating his left shoulder against the Brisbane Lions in round 16. But Ashcroft is hopeful the dual Brownlow medallist can return to his best this season. "Gaz is ready to play but we've been really conservative and our medical team suggested he wait at least another two weeks. From Gary's point of view, he's ready to go," Ashcroft said. "For the first pre-season in a while we've had to hold him back, so that's a good sign. He'll play JLT (round) three, which is in two weeks' time. "Based on what he's done in the pre-season, we're really confident he'll have a great season and hopefully gets back to the lofty standards he's had in his Brownlow years."